PROPERTY sales during May recorded a strong growth compared to May 2013 according to figures published by the Department of Lands and Surveys giving hope that a recovery in the island’s property market may be underway. During May a total of 551 contracts for the sale of commercial and residential properties and plots of land were deposited at Land Registry offices across Cyprus; an increase of 157% on the 214 contracts deposited during the same period last year. Of those 551 contracts 72% (398) were deposited on behalf of domestic buyers, while 28% (153) were deposited in favour of overseas buyers. Overall sales during the first five months of 2014 have increased 20% compared with the same period last year. However, this increase should be treated with some caution. Much of the improvement may result from the drop in sales last year following the decisions of the Eurogroup that resulted in the closure of the banks for several days and the restrictions imposed on trade. Domestic sales in May increased by 178% compared with the same month last year, rising to 398 from 143, with sales improving significantly in all districts. In percentage terms, Famagusta experienced the greatest improvement with domestic sales up 533% compared to May 2013. Sales in Nicosia went up 329% and sales in Paphos increased 188%, while sales in Limassol and Larnaca increased by 178% and 36% respectively. During the first five months of 2014, domestic sales are up 22% compared to the first five months of 2013, having increased to 1,307 from 1,073. Property sales to the overseas market in May performed strongly with sales more than doubling compared to May last year rising to 153 from 71; sales were up in all districts. 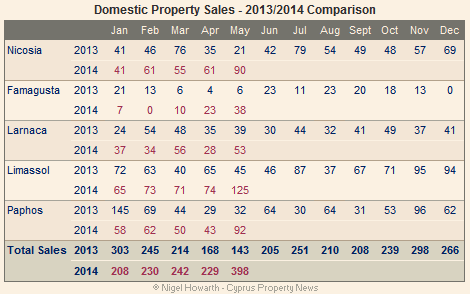 In percentage terms, Nicosia led the charge with sales increasing 800% to reach 27 compared with 3 in May last year. Sales in Larnaca increased 140% to reach 24 compared with the 10 sold last year. 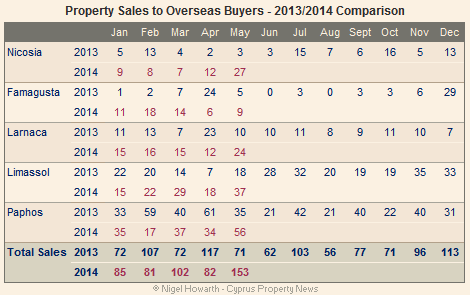 Sales in Limassol rose 106%, while those in Famagusta and Paphos rose by 80% and 60% respectively. During the first five months of 2014, sales to the overseas market are up 15% compared to the same period last year having increased to 503 from 439.